My wife and I made out way of Paris to Normandy to attend my friends wedding (the reason why we were in France). The day after the wedding, we spent a leisurely day in Évreux, the largest town near the wedding venue. 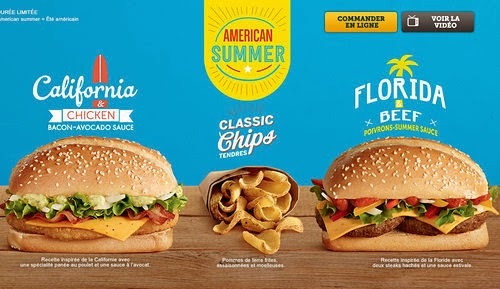 Since it was a sleepy Sunday in a small town in the French countryside, which meant was only a single other restaurant open for lunch and it didn't look all that impressive, so it was a perfect opportunity to try the two "American Summer" promos, the first of which I'll review was the "California & Chicken". Although released in the same series, we didn't get the Classic Chips this time, since they were such a disappointment when I ordered them with The 280 Recette Fromagere. I guess the "California" in the name must have been the special Bacon and Avocado sauce which topped the burger since the "Chicken" was just a standard chicken piece used in other burgers. Unlike some of special-sauced burgers in Asia, this one actually had a generous serving of the special sauce, but unfortunately...it wasn't any good and the burger probably would have been better with half the amount provided. Going in, I knew it was a Bacon-Avocado sauce, but my wife went in blind. When I took my first bite, other than being a lukewarm burger (there were hardly any other customers, and we were in the countryside, I can see why it sat for a while), it didn't turn me off all that much. I didn't think it was great, but I didn't think it was that bad either. The sauce was heavy on the "bacon" and very light on the avocado. So much in fact that if you told me that it was purely a bacon sauce, I wouldn't have questioned you otherwise. The bacon, wasn't a fresh bacon either, it tasted like those bacon bits you can have on your salad. I also believe that it was similar to the sauce served along with the fries, that it was fresh cream based, rather than mayonnaise based since it had a tangy after-taste which I've never noticed with any of the mayo based sauces. I have been unable to find any ingredient list for this sauce, so if you know for certain, leave a comment, or message me on Twitter. The processed cheese slice was supposed to have bits of pepper inside, and although you could see them, it added nothing to the taste whatsoever. I think this may have been because the sauce was so overpowering. The lettuce was green I'll give it that, but that's all the praise I'll give, because it was very limp and soggy. My wife took a bite, thought that it was pretty gross, but praised the white meat chicken patty (which is a rarity in Singapore) but since we had a number of other things to try, didn't elaborate any further, so we moved on to other items. After a couple minutes, I moved back to California & Chicken, where it had progressed from lukewarm, to that point where something is no longer warm, but you can't consider it ice cold either, slightly higher than room temperature. But let me be clear, it's not like my wife and I had a 1 hour conversation between our first bites and the second, this couldn't have been more than 3-4 minutes. Either I didn't notice it before or it was masked because the burger was warmer, but the sauce had a terrible, off-putting smell. I took another bite of the burger, and I actively disliked it, which was a big change from the first. I asked my wife as she took her second bite, if she thought it also smelt like sweaty armpit (the closest comparison I could think of). She immediately put the burger back down, and that's where it remained until we left, although I did try to dip a couple fries in the sauce to see if I could get ANY avocado flavour out of it...I failed). I guess the combination of artificial bacon, (sour) cream, and whatever avocado was supposed to be in the sauce just didn't fair well with the temperature change. That, or it was made right when they started lunch service (about 90 minutes prior) and had been festering under a heatlamp until our arrival. As terrible as this burger was, at least the restaurant itself was cool enough. It couldn't have been more than a couple years old.